Situated on the Yorkshire Coast just to the north of Atwick village, this is another WW1 site with very little history. Its location was 3 miles from Hornsea railway station and it was listed as a 2nd class landing ground. It covered an area of 50 acres in open surroundings, half a mile from the sea. 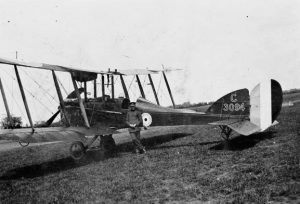 The site was another used by 76 squadron, Royal Flying Corps. which operated with DH 6s on anti u boat patrols. The landing ground closed immediately after the war and there is no trace of it today. DH-6 B3091 near Robin Hoods Bay. On 8th July 1918 this aircraft suffered an engine failure and was force-landed 3.5 miles South West of Robin Hoods Bay, the aircraft was undamaged and the pilot uninjured. Given the known distance this landing probably occurred on moorland and this would seem remarkable that no damage was sustained. I would suggest that either some slight damage was sustained or the distance from Robin Hoods Bay is not correct.